There is something about your kids taking an interest in what you do for a living that makes you want to burst with pride. 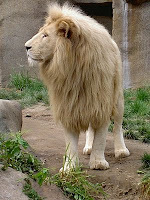 This morning the kids were watching a doco on White Lions on the Animal Planet Channel. Excitedly they race in and grab me, "Look dad, the vets are spraying the white lions with Frontline Spray to keep fleas away", my son says. "You should put it on the VetShop blog, dad" says my daughter. "How's "Frontline Spray Good Enough Even for White Lions" as a headline?" she asks. And so, being the proud dad I am, that's today's headline. Sure enough, the zoo vets were spraying their white lions with the distinctive Frontline Plus white and blue spray bottles, and frankly, that's not surprising. Frontline is a very good way of controlling fleas on cats, and big cats are no different. The size of lions and other big cats makes Frontline Plus spot on treatment not really an option, so, just like lots of very large dog owners, the zoo vets use the spray form of Frontline to control fleas, carefully ensuring that they use the appropriate dosage for animals the size of lions.